You will have a view one way or another on the length of maternity leave. This article is fascinating. Thank you to The Times for their good journalism on this subject. I am interested to see that the Bill and Melinda Gates foundation offered a year in the first place. For a US employer, it is unusual. To reduce it down to 6 months based on thorough research, data and facts is a decision being made for the right reasons. We talk about WoMos all the time on this site. It’s what we do. I talk to WoMos and hear their stories and unequivocally I can confirm that the women who take off a year find it harder to integrate back into the work place. When women are on maternity leave, companies keep moving forward and changing. We live in a world where the speed of change is hard to follow when you are in a company, never mind out of it. Keeping female talent in the workplace is good for business and in our view here at WoMo towers, good for the mother. If you choose to return to work and you want to get back into the workplace, the transition is easier if you keep in touch with the business, receive regular updates, attend townhalls/meetings and return sooner rather than later. If you want to be a stay at home Mum, then that is equally your choice. There is no right or wrong, but for the women who want to keep the Wo in their WoMo, a shorter maternity leave can mean a quicker and easier transition back into the workplace. 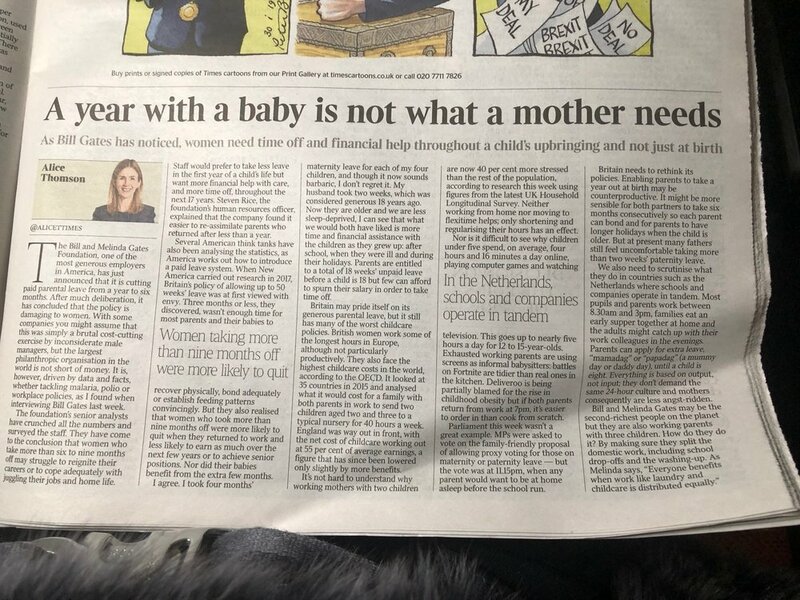 The article goes on to talk about childcare policies which can hinder the decision making process. There is so many factors to think about when returning to work, and there is no ‘one size fits all’. Regardless of your view, its an article that will get your opinion juices flowing!